Fragipan, that compacted soil preventing crop root penetration, covers an estimated 50 million acres of farmland in the eastern US. Tillage, even deep ripping, didn’t begin to contend with the deeper compaction and layers of fragipan. Then in the late 1990s, as the idea of no-till agriculture began to gain more attention, an Illinois farmer began to experiment with annual ryegrass to begin to contend with erosion on his hilly acreage. Junior Upton, Jr. began with a test plot of annual ryegrass. 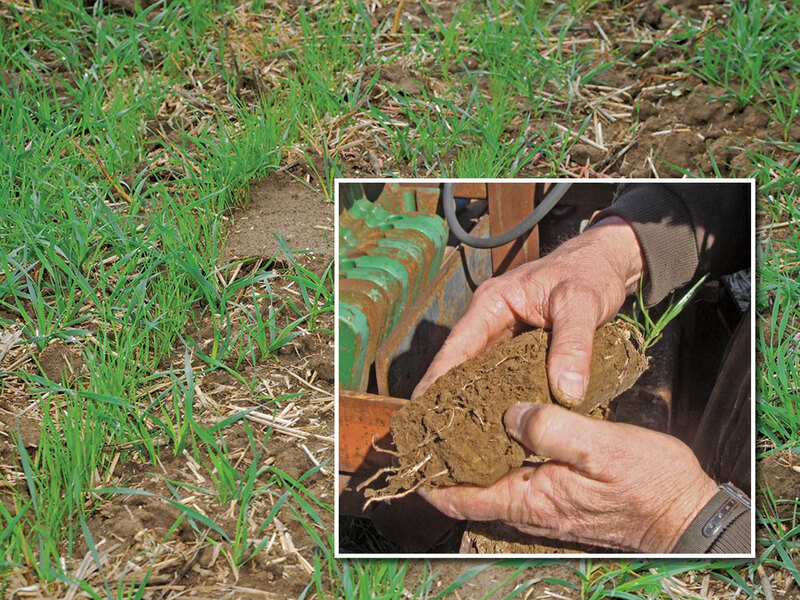 Working with soil agronomist Mike Plumer (U. of Ill. Extension), they believed that annual ryegrass would grow well in low pH soil (like fragipan) and build organic matter because of the vast mat of roots thrown out by annual ryegrass. He planted the grass seed after harvesting corn and then eliminated the crop a few weeks before planing corn again in the spring. In a Farm Journal story a few months ago, by Chris Bennett, he quoted Mike Plumer about that experience with Upton. “In just the first year of use, we saw (annual ryegrass) roots 24″ to 28″,” said Plumer. “The second year was 30″. After four years rooting, (the annual ryegrass root measurement) was at 60″ to 70″,” Plumer added. In normal fragipan, soybean roots often only reach 12″, but after five years of annual ryegrass, Plumer recorded soybean roots at 36”. The article goes on to say that after killing the annual ryegrass, the roots decay and leave a network of channels for corn or soybeans to occupy. With continuous no-till, the channels created by annual ryegrass allow corn and soybean roots to push deeper each year. Another discovery: As root depth increases, yields also expand, as Plumer explained . “On Junior’s farm, we’ve got some fields 16 years in the making. His corn yields, before we started, were at a five-year average of 85 bu. per acre, but after six (additional) years (with annual ryegrass cover cropping), he was over 150 bu. per acre. After 10 years, he was over 200 bu. per acre, and it is all documented,” Plumer says. And the miracle of annual ryegrass continued. As the depth of corn and soybean roots grew, Upton and Plumer measured a remarkable increase in soil nutrients being pulled from deeper soil up to service the crop. “The ryegrass went so deep and picked up phosphorus and potassium. We were doubling and tripling the phosphorus and potassium tests without making applications,” Plumer added. This entry was posted in ARG Blog and tagged annual ryegrass, annual ryegrass cover crop, compacted soil, cover crops, eliminating fragipan, Farm Journal, fragipan, Mike Plumer on March 23, 2018 by RyeGrassWordPress.